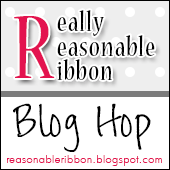 Hello, and welcome to the July Really Reasonable Ribbon Blog Hop! I'm so glad you're here, and hope that you came by way of Bonnie's Blog. However, if you just happened along, you can get started and caught up very quickly by visiting the Really Reasonable Ribbon Blog. 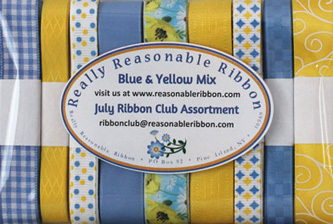 This month's FABULOUS Ribbon Club Assortment is a gorgeous collection of Summery country blues and yellows. Just look at this lovely assortment! This sweet bow I'm sharing today includes a bit of each trim from this month's collection including a piece of 5/8" Plaid Ribbon in Capri Blue, 3/8" Diamond Satin Daffodil, 3/8" Yellow and Blue Confetti Dot Grosgrain Ribbon, 5/8" Capri Blue Taffeta Ribbon, 5/8" Yellow Poppy Print Satin Ribbon, 5/8" Daffodil Delicate Satin Stitched Ribbon, 3/8" Blue and Yellow Diamond Print Grosgrain Ribbon, 3/8" Capri Blue Checkerboard Ribbon, and 5/8" Satin Swirls Daffodil. All of Really Reasonable Ribbon's trims work together and compliment each other SO well. The back side of the hair bow is secured with a French Clip, which is just one of the many styles Hair Accessories and products carried at Really Reasonable Ribbon. Isn't that floral ribbon just the sweetest trim ever? I'm SO loving the blue and yellow combination in this month's Ribbon Club Assortment. The next stop on this Blog Hop is at the sweet blog of my teammate, Kathy. She is sure to have something wonderful prepared for you. And....don't forget to answer the question at the end of the hop to be eligible to win this month's AWESOME Ribbon Club Assortment. Oh what a yummy selection of ribbons Karen - and you have displayed them beautifully on your barrette! That is the perfect summertime bow, Karen! So pretty! Beautiful hair bow. The combination of all the ribbons work beautifully together. Beautiful bow with your RRR assortment, Karen! Another beautiful hair bow Karen. I'm loving the look of the pretty roses you tucked in as well. Very full bow! Mine never look this good, but I keep trying. Thanks for showing me that it can be done! So very pretty! The blue & yellow is one of my all time fave color combos, so I really love this month's assortment. Love the addition of the flowers! This collection is just beautiful all together like that. Your bows are always delectable! 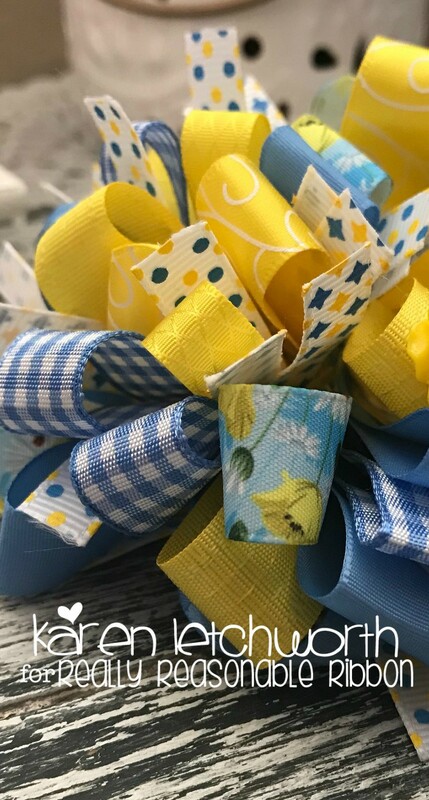 Love your yellow and blue hair bow, Karen!! Love this blue & yellow mix! Beautiful bow! 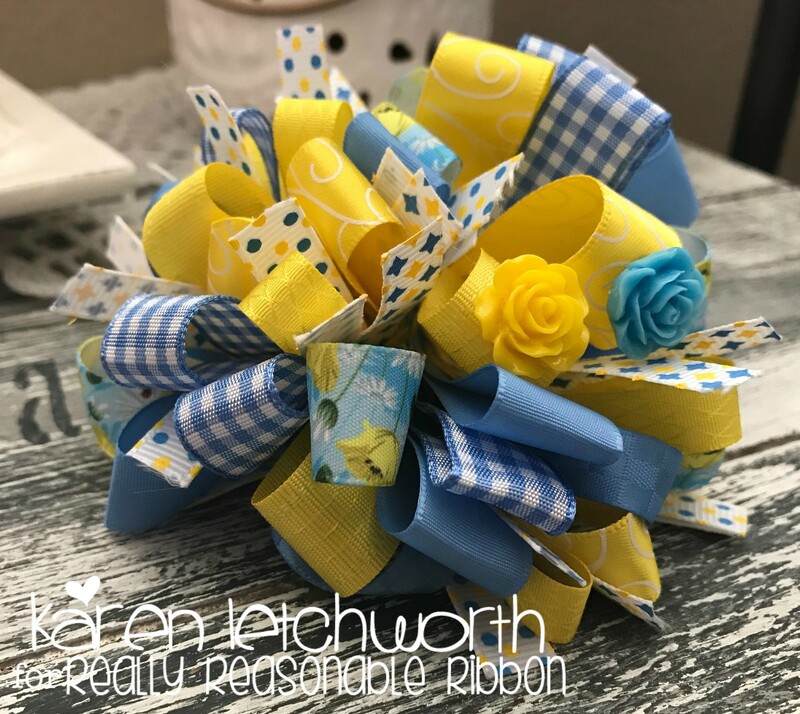 Thanks for making this gorgeous bow showcasing all of this month's ribbons. It really helps to see all the ribbon out of the package tfs.